BR 01-96 and my BandRbands.com straps. I first found BandRbands.com in 2011. 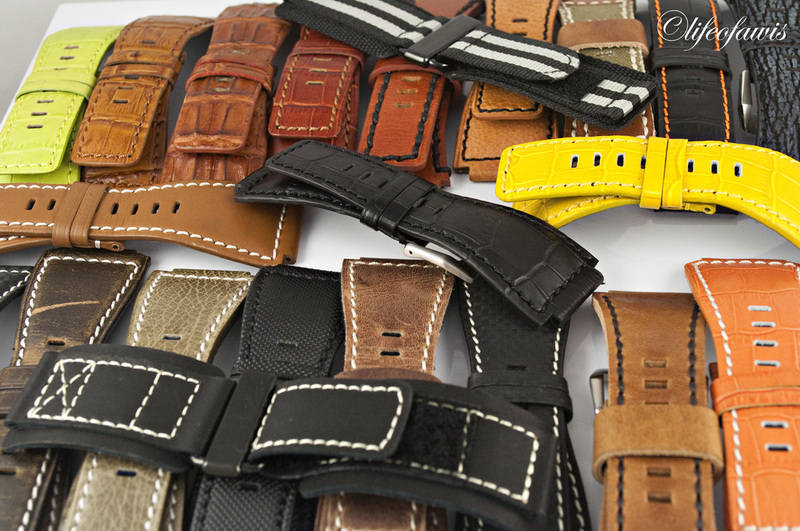 Unlike most websites that sell pre-made aftermarket straps, BandRbands.com offers the same straps in several sizes (S, M, and L). It is easy to understand why most sites do not carry multiple sizes... less inventory on a niche product. But for someone like me who falls under one of the extremes when it comes to wrist size, being able to buy a short length strap like that is priceless. 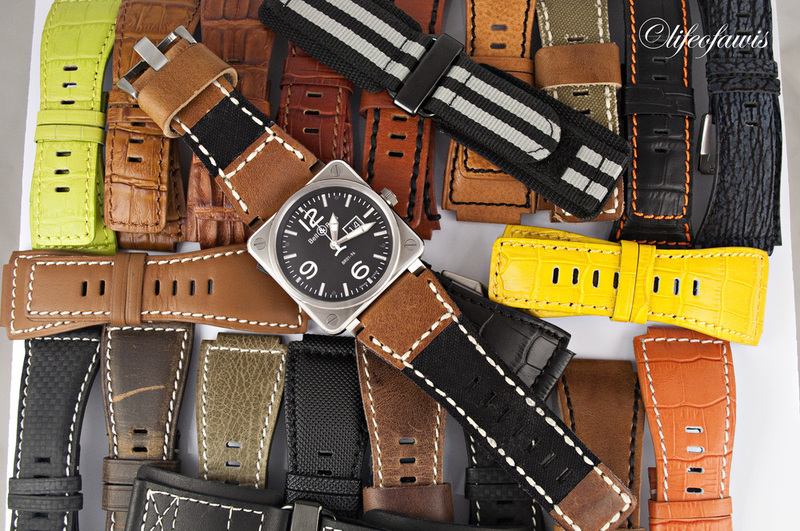 And speaking of price, the straps are affordable and of excellent quality. Needless to say, I went crazy buying straps for my Bell & Ross watches for the next few years. In total, I have purchased over 30 different straps from BandRbands.com (I blame their great selection of materials and colors). Though I have only purchased their Bell & Ross straps, they also offer regular straps with 20/22/24mm lug widths (for Panerai, Rolex, Breitling, etc.). And as if the quality of the straps, short length availability, and fair prices were not enough to keep me a happy customer, the owner Ron takes customer service to a whole new level. Ron makes you feel good about spending your hard earn money on his products, which is rare. I met Ron last year when he was in town for a short vacation (he's based in New York). He is very down to earth, great to chat with, and easily one of the nicest persons I have met... and a WIS of course! I had a great time talking with him about straps, watches, and family while enjoying a couple cold beers. Wrist shot with Ron from BandRbands.com during his visit to LA. 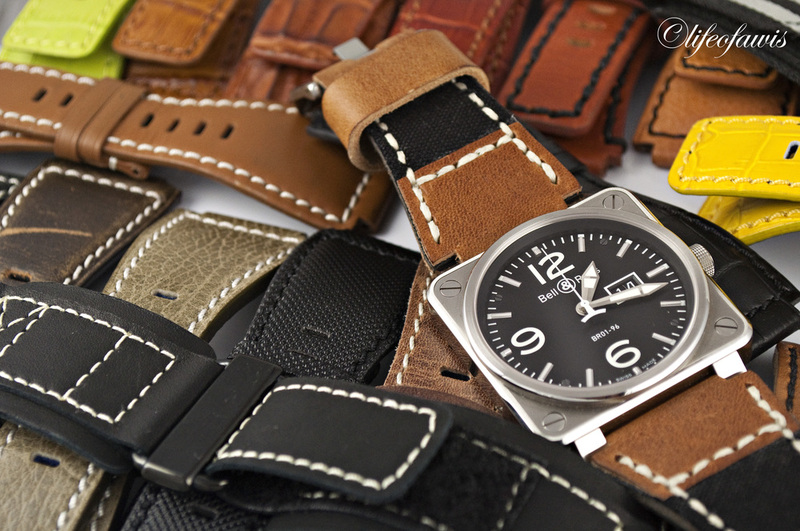 If you are looking for an aftermarket strap for your Bell & Ross or any other watch that has a 20/22/24mm lug width, give Ron at BandRbands.com a try. I am confident that you will be satisfied with their products and become a loyal customer. BR 01-92 CF on embossed sunshine gator. BR 02-92 on swiss ammo pouch. BR 02-92 on gray nubuck shark skin. BR 01-92 CF on black leather velcro. BR 01s on french canvas ammo pouch style. BR 01-97 on honey hornback alligator. BR 01-97 Commando on embossed lime gator. BR 02-92 on embossed honey gator. BR 01-96 on maple ammo pouch style. BR 01s on embossed honey gator, ballistic waterproof, and embossed gray gator.